The Valentine's Day party at school is fast approaching and you need adorable mini cards for your child to bring to their classroom. 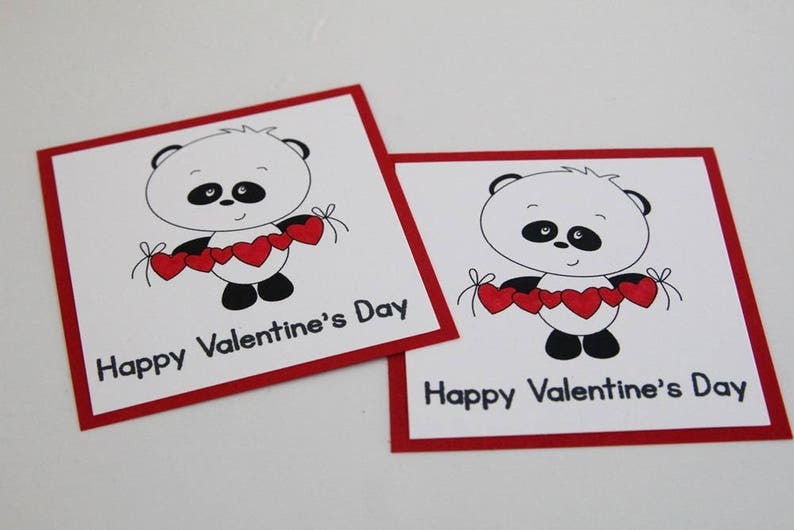 These super cute panda bears with hearts are perfect for boys and girls of all ages. The simple Valentine message gets the point across without being too mushy for fellow classmates. The panda image is printed and colored with artist markers. The sentiment is hand stamped with black ink under the panda image. This white layer of card stock is placed on a red card stock square. The back of these flat mini cards has been left blank, leaving you plenty of room for any to/from message. You will receive matching sized envelopes with this order and you get to choose the amount you need. Metric size: 7.62 x 7.62 cm.